DESCRIPTION: It looks like it's scowling. Garter snakes: they’re the most harmless species of snake in North America. They are non-venomous, extremely docile, and easy to find either at the pet store or in your own garden. It’s not uncommon for the person who finds the garter snake in the backyard, to want to keep it. However, there are also some individuals who either consider garter snakes to be nuisances, or they simply are afraid of snakes altogether. How does one get rid of this unwanted guest? One of the first things to do is to reduce the attractiveness of the habitat. If you have tall grass or tall weeds, mow the grass and clear out the weeds. These items give garter snakes prime places to hide. 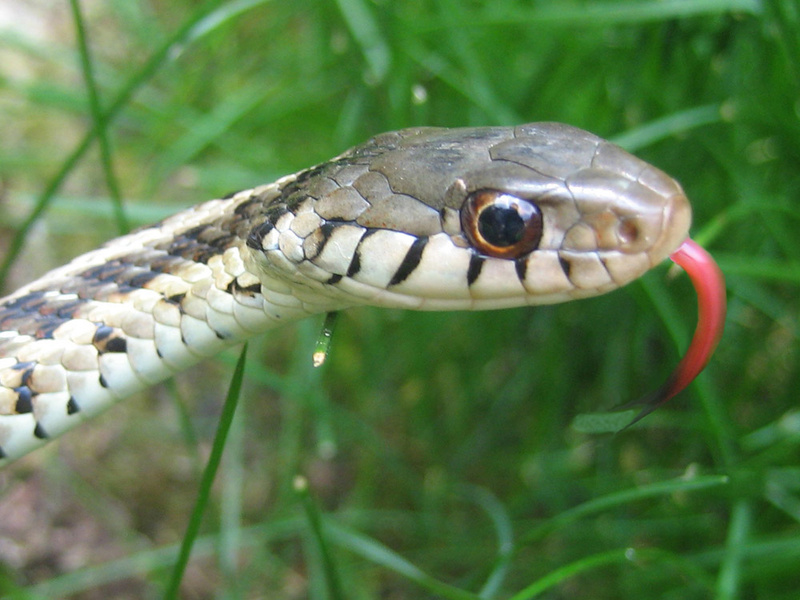 Get rid of the tall grass and weeds in order to get rid of the garter snakes. Trim any bushes or shrubbery – especially the part of the bushes that are near the ground – and remove any rocks or any other material that again, may serve as a hiding place for the snake. Another way to get rid of garter snakes, is the remove their food source. Use mouse and insect repellents in your yard to drive away the things that garter snakes like to eat. When there is no food left to eat, the snake will move on. You can also get an outdoor cat. Cats are a garter snake’s natural predator. Therefore having one in your yard can be effective at keeping the garter snakes at bay. Finally, if all else fails or if you want the most effective way to rid yourself of garter snakes from the get go, call an exterminator. A pest control officer can trap and remove garter snakes effectively, and also assess whether you have a few garter snakes or an infestation.